Ramadan Energy Bar is made of a unique, proprietary blend of complex and simple carbohydrates and soy protein, that is specifically designed to maintain blood sugar over many hours. Its naturally flavoured and wheat free, with just the right balance of great taste and healthy nutrition, it is the perfect protein snack to supplement your Suhoor! Our proprietary blend of ingredients allows for the slow release of sugar over many hours . Our blend is useful in preventing low blood sugar due to fasting . Our proprietary blend is slowly absorbed by the body so it can provide a continuous source of energy for 6-9 hours . In subjects with diabetes, the blend was found to maintain blood sugar for 9-10 hours after eating it . Studies show, significantly less subjects experienced low blood sugar with a snack like ours . 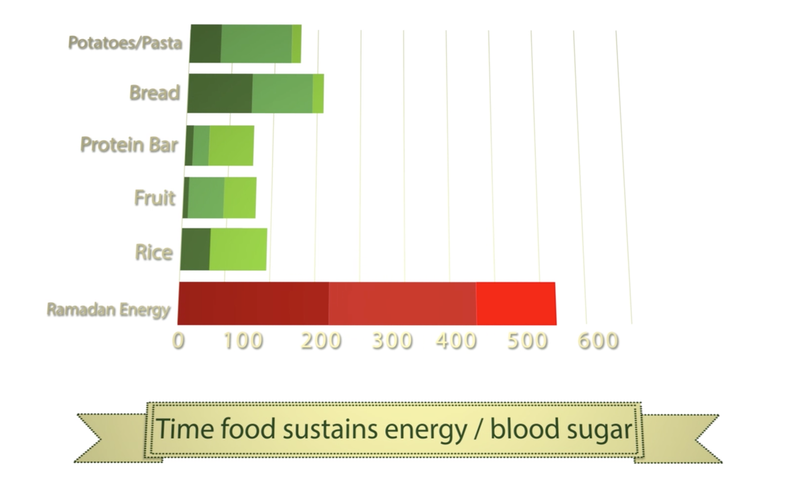 A snack bar containing our blend can decrease night time and morning low blood sugar in subjects with diabetes . Smith GPA, Berger R, Potasnick R, Moses SW, Fernandes J (1984) The dietary treatment of children with type 1 glycogen storage disease with slow release carbohydrate. Pediatr Res 18:879-881. Chen YT, Comblath M, and Sidbury JB (1984) Cornstarch therapy in type I glycogen-storage disease. N. Engl. J. Med. 310, 1721-1725. [3,4] Kaufman, FR, Halvorson, M, Kaufman ND (1995) A randomized, blinded trial of uncooked cornstarch to diminish nocturnal hypoglycemia at Diabetes Camp. Diabetes Res. Clin. Pract. 30, 205-209. [5,6] Kaufman, FR, Halvorson, M, Kaufman ND (1997) Evaluation of a snack bar containing uncooked cornstarch in subjects with diabetes. Diabetes Res. Clin. Pract. 35, 27-33.